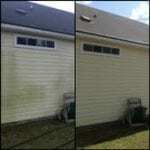 Cleaning your home on a planned schedule should be part of your overall exterior maintenance plan. If you are a “Weekend Warrior” and want to clean your vinyl home just be sure to plan your work and wear the proper personal protective equipment. Vinyl siding is very low maintenance and does not need painting; however, it does need to be cleaned periodically to maintain its appearance. You have the pressure washer, high pressure hose and the trigger gun with appropriate tips and you are ready to knock this project out. A few things you should consider before you start your pressure washing project. Be sure you have enough water hose to reach your entire project area. More on this later. Familiarize yourself with the pressure washing tips. Your manual should explain the different colored tips. Most pressure washers come with a downstream chemical injector. This is the easiest way to apply the chemicals. Downstream chemical injectors only work on low pressure. The black tip is for applying chemicals. Read your manual for additional information. Pre-mix your chemical solution in a 5 gallon bucket. However, only mix 3-4 gallons in case you need to add more bleach. A good starting point would be 2 gallons of bleach, 1.5 gallons of water and about 16oz of original Dawn dish detergent. Most professional washing companies use professional soaps with enhanced cleaners and rinse aids. After you have hooked the water hose to the pressure washer. Check to be sure you have no kinks in the water hose and go ahead and lay your hose out in the direction you will be moving the pressure washer. Turn the water on then pull the trigger and wait a few seconds. You should see a steady stream of water coming from the tip. It is critical that as you move the pressure washer you ensure there are no kinks in the water hose. Starving your pump for water will quickly damage your pressure washer. Pre-wet all landscaping that may be damaged by chemical solution and move any objects that may be damaged by overspray when applying chemicals. Pre-wet siding, gutters and windows especially if it is very hot and/or in direct sunlight. This will reduce the risk of possible irreversible damage. Assuming you have the pressure washer ready with the appropriate chemical solution, drop the chemical suction tube into the house wash solution and spray the soap solution on beginning at the bottom and working up towards the roof line with low pressure. Most pressure washers come with a chemical tip for applying soap (black tip). Do not spray too large an area until you feel comfortable with how much area you can spray without letting the soap solution to dry before rinsing. Apply the solution evenly including on windows, doors, etc… Allow the soap solution to dwell on the siding but do not let it dry especially on gutters and windows. On hot days and/or siding, gutters and windows in direct sunlight should be pre-wet and rinsed sooner than cooler, shaded days. Change to a higher pressure tip (white, green or yellow). After changing tip, there will still be chemical left in the high pressure hose. Re-spray stubborn areas until all chemical is flushed from hose. Begin rinsing at the top and work your way down with higher pressure. It is best to point the wand in a downward method while rinsing. You may need to scrub stubborn areas prior to rinsing with a soft bristle scrub brush. Always begin rinsing at a safe distance from the vinyl ensuring no damage can be done. As you begin rinsing, move closer to the siding until you can effectively clean and rinse it without damage. Too much pressure will permanently etch the siding. Some contractors will actually rinse the windows first, and then proceed with the rest of the soaped area. Then, they will rinse the windows again. This will ensure you do not stain the windows with soap or bleach.